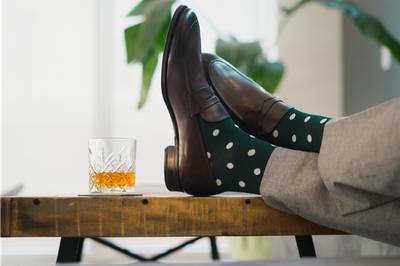 Southern Scholar is a premium men's subscription sock club out of Dallas, Texas. Kevin Wohlman founded Southern Scholar just out of college while working in the business world and was tired of the monotonous "shirt, tie, dark socks, dark shoes" uniform that he saw everywhere he looked. An entrepreneur at heart, Kevin saw high quality, high style subscription dress socks for men as an opportunity for gentleman to upgrade their style. Thus, through a lot of research and hard work, Southern Scholar was born 4 and a half years ago! ￼Southern Scholar's box arrived in very attractive, professional, masculine packaging. The box was small and the perfect size for the pair of socks enclosed. It included the socks, a postcard detailing what sets the socks apart from the competition, a card for laundering and drying instructions and a small business-sized card with a picture of the socks on one side and a style card on the other side with pairing recommendations from their stylists. ￼The socks this month are called "The B.B. Kings," in honor of the King of the Blues. They are a variety of blue, black and grey stripes and very soft. At the top of both socks, their Southern Scholar label is embroidered, which also adds a touch of class.